Even prior to the popularity of the IBM-PC (which in New Zealand didn't really didn't start to dominate until around 1983-1984), some manufacturers were already making serious microcomputers for medium to small businesses. These machines had 64k of RAM and typically ran CP/M with dual floppy disk drives. Japanese electronic firms in particular seemed to be active in this market and found export sales both in New Zealand, Australia and elsewhere. These Japanese 8-bit machines tended to be expensive but high quality. The Panasonic JD-850M is one such example. This 1982 model, powered by an 8085A CPU, is top of the range. Storage is via two 8-inch double-density double-sided floppy disk drives giving about 1Mb of storage each. This would have been a huge amount of floppy disk storage in the day. Three DB-25 serial ports are included around the back plus an IEEE-488. A detachable keyboard, common on desktop computers post-IBM-PC, was listed as a "feature" in the sales brochure! The computer is incredibly heavy, due to the steel case. I haven't weighed it but it would be well over 20kg. It oozes high quality engineering. The large green screen is crisp and stable, and the keyboard responsive and good to use. A quiet fan can be heard working inside the case when the unit is switched on. The machine came to me in near museum-quality condition with 46 8-inch disks. The software reflected its primary purpose i.e. keeping client records and accounts. 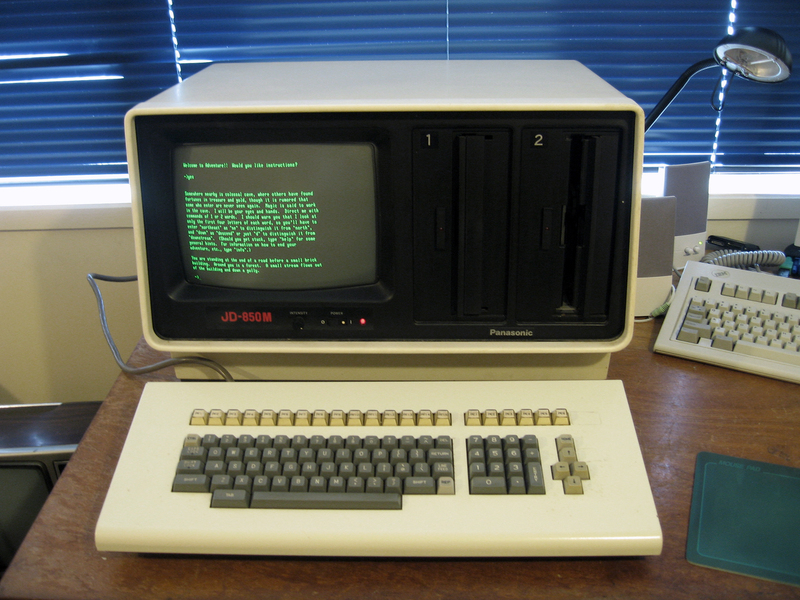 A text-only business machine like the JD-850M was not for games but I was pleased to find a copy of Colossal Cave Adventure on the System disk! While not a classic computer in its own right, this model is representative of a short-lived class of high quality "pre-PC-compatible" desktop business computers released by Japanese companies in the early 1980s. This is why I'm going to keep it as a formal resident in my rest home for retired computers!